Yesterday’s signals were not triggered, as there was no bullish price action at 112.41. Go short following a bearish price action reversal on the H1 time frame immediately upon the next touch of 112.41 or 112.83. Go long following a bullish price action reversal on the H1 time frame immediately upon the next touch of 111.66, 111.33, or 111.31. I wrote yesterday that much would now depend upon the U.S. stock market at the New York open later today. 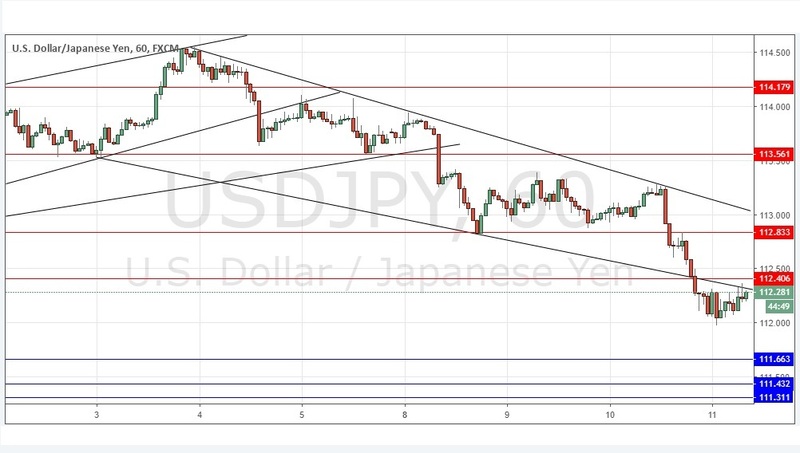 If we see another sell-off which gathers pace, the Japanese Yen is usually a safe-haven destination upon stock sell-offs, so we may be setting up for a downwards movement. This was a good call as the U.S. stock market made its strongest daily fall yesterday since February, and this pair correspondingly moved down strongly with heavy bearish momentum. There has been a small but significant recovery in recent hours suggesting the downwards movement could be over for the time being. It is also notable that the fall here was nowhere near as large as the fall in the stock market. Also, the bottom was close to the round number at 112.00 which gives me a little more confidence in it. There is an interesting area of support at 112.41 which has a trend line, a key horizontal level, and is also reasonably confluent with the psychological level at 112.50. So, I think if the price breaks above 112.50 soon it will be a bullish sign, while another failure in this area will suggest that a move down to 111.66 at least will be likely. There is nothing important due today concerning the JPY. Regarding the USD, there will be a release of CPI data at 1:30pm London time.